The diamond industry continues to follow processes and practices that, have remained static for many decades. As diamond veteran and CEO of GLITZKOIN states that, ‘…. the diamond industry is quite conservative, expecting a ready change to embrace technology is really asking for too much…’. It is therefore necessary to clearly define the benefits of trading on a diamond blockchain. Sellers from anywhere in the world could list their diamonds on a blockchain. Listings are restricted to certified diamonds for a very specific reason. The 4Cs used to define the grade of a diamond have been very clearly defined, there is little room for ambiguity. A certification from any one of the reputed diamond testing labs, will provide a report that can be trusted across the globe. Certified diamonds once listed can be accessed by buyers located just about anywhere. With the defined parameters for a diamond clearly defined on the blockchain and supported by a trusted certification, prospective buyers could be laymen with little knowledge about the glittering stone or seasoned diamond professionals. Simply put, the listing of certified diamonds inspires confidence in buyers. This translates into a more responsive market, something that diamond sellers of all sizes would appreciate. The diamond industry does deliver a turnover that is close to 90 billion dollars but, this is much lower than its true potential. At the end of the day, the benefits that every diamond seller would look for is undoubtedly, an increase in sales. One of the issues that makes buyers hesitate to buy diamonds is related to the possibility of getting fake diamonds. There are cases where fake diamonds costing a few dollars, have been sold as genuine stones. Buyers could end up paying thousands of dollars for junk. Certified diamonds bought over a blockchain that insists on a certification for every diamond listed, eliminate the possibility of fakes being transacted. This is surely something that has a positive impact on the market for diamonds. It is no secret that diamond transactions are generally of a high value, payments are routed through the banking system. The processes to clear payments can be cumbersome and bank fees can add a significant cost overhead. International trade is typically characterized by multiple currencies, conversion costs can further add to the cost. The GLITZKOIN project includes a crypto currency that will be used to settle payments for transactions conducted on the platform. This would be a relief for diamond sellers and buyers, no banking procedures to follow and no worry about multiple currencies. Blockchain technology is proving its powerful utility in a wide range of industries, the diamond industry cannot afford to stay aloof. Blockchain and crypto currencies can improve efficiency, profitability and market scope for the multibillion dollar industry. 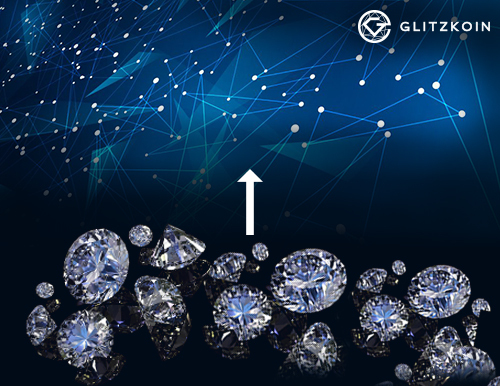 GLITZKOIN with its thorough understanding of the industry and the technology is geared to bring in change, a ‘now or never’ opportunity for the diamond community.